A dog who lived in a Merseyside animal shelter for almost a decade has finally found a home. 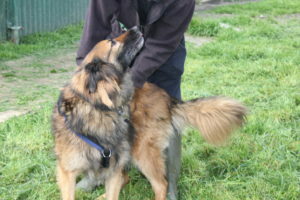 Floyd, a 10-year old German Shepherd cross, was saved by Freshfields Animal Rescue as a puppy, and had been in their Liverpool centre ever since. Now, after so long waiting, he has finally been adopted. The canine had been left emotionally scarred by his experiences before he was rescued, and so rehabilitating and rehoming him was always going to be a tough task for those working at the shelter. Debbie Hughes, 53, Freshfields’ PR co-ordinator, told JMU Journalism: “Floyd’s problems started because of the treatment he got when he was a puppy. When he came to us, he was so frightened that he would bite and bark and be incredibly distressed. Despite the dedication of staff, it was still very difficult for the Alsatian to trust people, and this was the main problem the centre faced when trying to rehabilitate the poor pup. Mr Barnett would become Floyd’s hero, when he finally became able to officially adopt his favourite four-legged friend. Mrs Hughes said: “Louis always wanted to adopt him. It was only when his beloved cat passed away recently that he could actually take Floyd home. The centre and its volunteers at Ince Blundell do all they can to help rescue pets, but at a huge financial cost. The centre told JMU Journalism that its vet bills run into hundreds of thousands of pounds every year, and the sanctuary relies on donations from the public to continue operating.